Dr. Brian believes in meeting a patient at their model of the world. This is why Dr. Brian offers both guarded care (once a week for one year, with re-examinations every twelfth visit then post x-rays at end of the year) and relief care (three times per week until you indicate you are better with re-examinations every twelfth visit), for those not interested in corrective care. This allows patients to learn and grow at their own pace. While adhering to his traditional roots, he also takes advantage of modern technology by utilizing instrument adjusting in conjunction with manual and drop table techniques. Although I am a 1967 Palmer graduate and Dr. Solofsky is a 1987 Life graduate, it took only a few minutes of conversation for me to realize that we have much in common. KOCH: Brian, you and I are fortunate to have personally known and studied with some of the grand masters who helped put chiropractic on the map. SOLOFSKY: Yes. We were both privileged to have been mentored and befriended by people like Larry Webster, Glen Stillwagon, Clay Thompson, Fred Barge and Sid Williams, to name only a few. That is priceless. 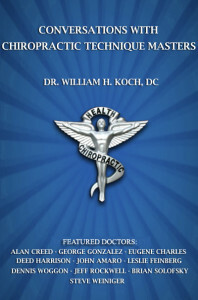 KOCH: That is why I relate so easily to your work and mission, which, like my own, is to share the wisdom of our profession’s super stars as well as our own knowledge and experience, with the up and coming generation of chiropractors. SOLOFSKY: If we don’t share it, Bill, I fear much of it will be lost. The biggest deficit I see today in our profession is in the area of technique. The students in many of our schools do not even know the names or historic origins of the techniques they are being taught. They learn a little bit of this, and a little bit of that, but with no context or continuity. It is very confusing to them. It seems that no one teaches them how to determine when and how to use a given technique, and just as importantly, when not to. KOCH: That is why many young chiropractors lack confidence in their abilities. It is also why they resort to treating their patients using the allopathic model of treating symptoms rather than adjusting to correct the cause. This serves neither the doctors nor their patients. SOLOFSKY: You are absolutely right. The good news is that many recognize their deficiencies and are hungry to learn and bring their skill sets to a higher level. KOCH: You and I have spoken at length about the chaos and uncertainty in every corner of healthcare. Share with our readers, where you see chiropractic going as we move further into uncharted waters. SOLOFSKY: Bill, as you know, I have very strong opinions on this subject. There are a lot of people in the profession who are taking it in what I believe is the wrong direction. There are now a lot of “designer techniques” that do not even resemble chiropractic, as we know it. All this is confusing to chiropractors and the public alike. I think we need to get back to chiropractic in its purest form. SOLOFSKY: Yes, Bill. Instrument adjusting plays an important role in my adjusting protocols. There are things I can do with my hands that I cannot do with adjusting instruments and there are things I can do with adjusting instruments that I cannot do with my hands. In my seminars, Principles 2 Adjusting™, the first weekend is Principles 2 Practice™, the second weekend is Principles 2 Adjusting™ and the third weekend is Principles 2 Analysis™. When doctors complete the series, they should understand not only what needs to be done on any given patient, but how and when to do it. KOCH: I think we have similar goals in our teaching. I like to talk about getting back to the basics of doing a really thorough first visit consultation, examination and analysis. I emphasize the importance of the initial consultation during which the doctor really listens to the patient. I believe that if we pay attention, the patient will give us clues that help us direct the next steps of examination and analysis. I believe it is of utmost importance that we take our time during this first visit and record carefully all the details of our findings. Not for insurance claims, but because it is vital information we need to provide quality care. The adjustments must be specific and based on the objective findings of the examination. Otherwise it is just an exercise in bone crunching, not scientific chiropractic. KOCH: Where do you see chiropractic going in the strange new world of Obama Care? SOLOFSKY: I only see it going one way. The profession will be divided into two groups: Those who participate and jump through whatever bureaucratic hoops it takes to get paid. And then there will be those, like you and me, who continue with cash practice as we have always done, delivering the kind of care that we would want to receive if roles were reversed and we were the patients. KOCH: Exactly right, Brian. It is really that simple. Brian, to illustrate that point I’d like you to relate a story you told me about how the insurance industry planned to seize control of the future of chiropractic. SOLOFSKY: In the early 1970s, when there was little if any insurance coverage for chiropractic care, an insurance executive told one of my friends what he foresaw as the future of our profession. He said, “Health insurance policies will soon begin covering chiropractic and the chiropractors will be paid very well. They will be able to live better with bigger offices, houses, cars and all that goes with them. KOCH: That paints quite a picture. The sad part is that his prophecy is being fulfilled. That makes our mission very clear: We have to preserve chiropractic as we know it, not just for the sake of the profession, but for our children and grandchildren and everyone else who chiropractic can serve in the near and distant future. The only way this will happen is for there to be a solid core within the profession that remains true to the traditional principles while practicing using the best of advanced contemporary techniques along with those that have stood the test of time. SOLOFSKY: You hit the nail on the head, Bill. Chiropractic must be autonomous to survive in this environment. KOCH: I agree. I worry that the trend to merge chiropractic with medicine will cause chiropractic to morph into something unrecognizable, as happened with osteopathy, and will be lost as a separate and distinct discipline. SOLOFSKY: I am doing my part to protect and preserve everything that makes chiropractic great, and which has allowed it to survive, grow and prosper for these 119 years. KOCH: That is my goal, as well. And I intend to leave it better and stronger than I found it 50 years ago. Brian, I have really enjoyed our conversation. Let’s keep in touch and talk again soon. While I have not yet personally attended any of Dr. Solofsky’s seminars, I have reviewed his manual and looked at some of his DVDs and can say that his work is impressive. Additionally we have had many hours of animated conversation, which I found very interesting and enjoyable. While our methods differ in some aspects, for example, I do not use a drop table we do have a lot in common. Because we use the same electronic instruments and both use similar instrument adjusting and manual techniques within the framework of our individual protocol styles, I am very confident in saying that Dr. Solofsky’s technique approach is effective and serves his patients well, as it would any doctor who chose to study with him. I applaud Dr. Solofsky’s willingness to work with his patients and align his goals with theirs, whether it that is for corrective or symptomatic care. This is especially important in our current economic environment where practicality often has to trump the ideal. Our willingness to work with patients gives them confidence in us and our intention to help them in any way we can. That Dr. Solofsky utilizes a variety of techniques in his protocols allows him to accommodate to the changing needs of the patient. Any doctor or technique that does not accommodate to the changing needs of the patient and their condition is doomed to fail. A recipe for success is when we as the doctor first align our goals with those of the patient. This ultimately comes back to us in the form of loyal patients and referrals.